Stale news from Britain | Notes from the U.K. Racing News: The Great Knaresborough Bed Race took place in June. It follows the tradition of bizarre British festivals, although it’s different from a lot of them in that it asks contestants to stay sober. The rules say all runners have to stay sober until after the race. 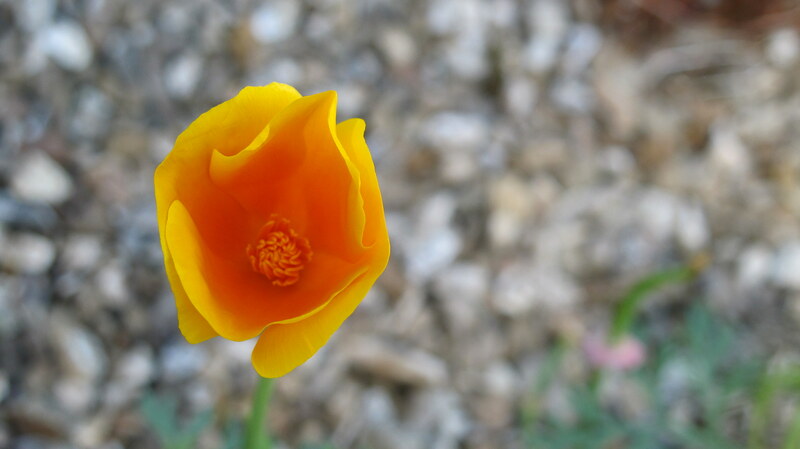 Irrelevant photo: A California poppy in Cornwall. The beds have to be this height, that width, and some other length. They have to have wheels. The wheels have to meet so many specifications that I passed out reading them and had to be revived by two shih tzus and a cat, who wanted supper or they’d have let me solve my problem all by my unconscious self. The beds also have to float, because they’re going to cross the River Nidd. And they have to have ropes attached, although the ropes can’t be attached to any person. The ropes allow the runners can pull the bed when they start swimming. All beds have to keep to the left except when they’re overtaking. Overtaking means passing. It is not the opposite of undertaking. English is a very strange language. Do not discuss this while swimming a bed across the river Nidd. The whole thing sounds terrifyingly well organized. Inevitably, the official video shows people in fancy dress, which means in costume, which, this being Britain, means a fair number of men dressed as women. No, I don’t know why they do that. It’s just something men do here. And just so we’re clear, these aren’t drag queens. Drag queens have flair. These are straight guys and they’re aiming for the Cinderella’s stepsister look. Maybe that’s what they think women look like. The race (as I said above; pay attention, please) took place in June. If you join in next year, do send photos. Social Media: While we’re talking about being late with a piece of news, last January the Conservative Party held a training session for its Members of Parliament. The idea was to help them use social media to present themselves to their constituents as real people so that younger people would love them and instantly run out and vote for them, even before an election was called. Several MPs responded by rushing out and posting frozen pictures of themselves standing in the kind of expensive buildings where politicians do business. They did not look like real people. They may not have been real people. I didn’t rush out and vote for them, but then I’m not in any of their constituencies and I wouldn’t have voted for them anyway. But I’m just saying, it didn’t work for me. Then in March, Conservative MP Bob Blackman got so real that he posted an article claiming that the sexual abuse of white British children was part of Somali culture. It didn’t go over well and he said (I’m paraphrasing) that he was sorry if he’d hurt any feelings. That translates roughly to I’m sorry you got your feelings hurt when I stated the truth with less tact than I might have but gee isn’t everyone touchy these days? Blackman uses social media so fluently that he joined a number of Islamophobic Facebook pages but when contacted about it by Vice said he didn’t know he’d been added and removed himself. Does it strike anyone other than me as a bit odd that a site where any number of people praise Hitler consider fascist an insult? Or is it only an insult when you add Islam to it? If the party has held any more social media training sessions, it’s managed to keep them out of the news. Snakes: This past summer has been unusually hot by British standards, and that’s led to an unusual number of snake sightings. First, a quick review of the native reptiles. The BBC reports that “England is home to grass snakes, adders and smooth snakes, and to common lizards, sand lizards and slow-worms, slug-eating legless lizards.” The only one that’s poisonous is the adder, and they’re more of a worry for dogs than people. Not that dogs worry much. Some people don’t worry much either, and should. I’m still trying to understand why the slow worm is a legless lizard instead of a snake. It looks like a snake and it quacks like a snake, but a lizard it is. “It is illegal to kill or injure any of [the reptiles], with fines of up to £5,000 and six months’ imprisonment for offenders,” the BBC says. But forget all that. A fair number of non-native snakes have been sighted this summer, according to the Guardian. A boa constrictor was spotted on a London street, wrapping itself around a pigeon. In Exeter, a man found an 8-foot (or 2.4-meter, if that works better for you) python in his bathroom, asking to borrow his razor and shaving cream. It seems to have escaped from a pet store in the building and found its way to his bathroom through the plumbing. It wanted to shave off its beard, give itself a new name, and start a new life. About that “seems to have.” I’d have thought a store would know if it was missing an 8-foot python, but the article I read said “apparently.” Maybe shaving the beard worked–they didn’t recognize it as the 8-foot snake they were missing. Meanwhile (or before, of afterwards) back in London, a woman woke up to find a 3-foot- (1-meter-) long royal python curled up next to her in bed. And a runner found a baby boa constrictor in the bushes just before a race. What was the runner doing in the bushes? Relieving himself, as the paper so delicately puts it. And finally, a royal python that’s probably pregnant is (as I write this, which means was as you read it) missing in Manchester, although she may be hiding somewhere in the apartment of the woman who thinks she owns her. Manchester’s a long way from where I live, but Exeter’s not much more than an hour’s drive. I’m hoping the python hasn’t learned to drive. An estimated 2 million snakes live as pets in Britain. Pythons and corn snakes are particularly popular. Egg Throwing: And finally, to follow up on our theme of old news and bizarre contests, Deb (who’s popped up in the last three posts) sent me a link to a contest held in 2010, and since it’s news to me (and probably to you), it’ll do. A Lincolnshire egg-throwing contest wasn’t content with the traditional way of throwing eggs, where you take the egg in your hand, pull your hand back, and launch the thing as far as you can. This one introduced trebuchets. A trebuchet? It’s a medieval weapon developed to launch stones during a siege. You put a heavy weight on one end of the arm, pull the unweighted end down, load a stone in its basket, and let fly. Do this often enough and you can break down a city wall and massacre the residents. So yes, it’s a kind of catapult,but one with with a long range. I’d never heard the word till I moved to Britain. Did I say it was medieval? It was, but it was used in China as early as the fourth century B.C.E. (That’s B.C. in [Britishism warning] old money.) Only it wasn’t called a trebuchet there. What a surprise. You don’t have to call it a trebuchet if you don’t want to. Call it a catapult. What matters here is that it’s not meant to launch an egg. In the competition, the target–every throwing or launching competition needs a target–was a person. I’m going to guess that each team had to supply its own, but understand that I’m making that bit up. The World Egg Throwing Federation? It does exist, you can find it on Facebook, and you can even watch a video of a launch that was banned from competition because it used a tube that appears to turn the egg into a shoulder-launched anti-aircraft missile. Can we stop for a minute, though, and talk about the World Egg Throwing Federation president? That is a position, kiddies, that a person can be proud of. Put it on your resume and you’ll be guaranteed interviews. I’m not saying anyone will hire you, but they will want to see what you look like. You’ll do even better if you follow the advice offered by my partner, best known as Wild Thing: Change that title. Anyone can be a president. You want to be the Great Hen. Even if you’re male. The link I gave you above leads to a 2010 contest, but the contest continues year after year. Why would something this important stop? I could give you a link to the more recent one but since we’re dealing in stale news this week, we’ll stay with 2010. And now a bit of background on my research into this story. Understand first of all that no amount of research is too silly for me to undertake. When Deb first mentioned the contest, she misremembered it as a gravy throwing competition. Her brain apparently contained one egg throwing and one gravy wrestling competition and the combination led to a short circuit, producing a gravy throwing competition. When I googled the phrase gravy throwing competition, I found videos on how to throw a gravy boat–not as in now to launch it across a field but as in how to put a lump of clay on a potter’s wheel and make one. It was disappointing, but we can salvage something out of this: If your village is looking for a good fundraiser, you won’t find any others holding gravy throwing contests. There will be some problems to work out, but I can almost guarantee press coverage. Great press coverage. And please, send me an invitation. But back to egg throwing: I wrote about this festival before, but it was in the context of the presence of beer at summer festivals. (If you think I remember what I’ve written, you have no idea how my mind works and you can consider yourself lucky.) I can’t think how this happened, but in the earlier post I missed the trebuchets. That earlier post led Fragglerocking to drop me a line about egg jarping–an Easter tradition from the northeast of England. I was going to wait for Easter to tell you about it, but since you brought it up I’ll drop it in here. To jarp (is it a verb? ), one contestant holds a hard-boiled egg with the pointed side up. The other one brings another hard-boiled egg down on it so the pointed sides crash. The winner has an undented egg. The loser cleans eggshell off the floor. If neither egg breaks, the players trade roles and try again. No beer is involved and you don’t have to organize an entire village or town to do it, although you can. What do you do if they both break? For all I know, that’s physically impossible, but just in case, I recommend making sandwiches. While I was googling egg throwing (I just love the research I do for this blog), I found an article on last May’s convention of the U.K. Flat Earth Society–a group of people dedicated to the idea that, evidence be damned, you can believe whatever you want. It should be getting wildly popular these days, what with folks making up their own facts, although they have more of a sense of humor than most of the people who don’t demand evidence before dedicating themselves to a set of beliefs. The reason Lord Google led to to it was that the conference included a three-hour presentation about the earth being shaped like an egg. I’m not sure how you fill three hours with that, but I’ll admit to having known people who could fill three hours with less. And I won’t mention any names because they’d only call me. This entry was posted in News and tagged bed races, British festivals, British news, egg throwing, egg throwing festivals, snakes by Ellen Hawley. Bookmark the permalink. Worryingly all of these things seem relatively normal to me, there’s a Brit for you! But I do love that you never fail to make me smile, thank you. As long as we can both laugh about it, communications haven’t broken down. All’s well. People in this country will seize any excuse to form a club. Then they get all sorts of grand ideas and the next thing you know it’s a federation holding the world champship something-or-others. I hope there is a special hat! No hats to date. You’ll have to design one. It will need an egg basket on it!! And could double as an Easter bonnet. Sorry to get all stingy on you, but I’ve never been one for throwaway fashion. I’m still trying to find uses for me “Is it a greater crime to run a bank or to rob a bank?” tee shirt. It surprising how long the list of places you shouldn’t wear that is. Ah, predictive text: a bat they can put things in. Or maybe it’s just a slip of the finger. Hat, eggs, bat. Perfect. Then try to convince people that bats really do lay eggs. I like the shoulder launcher….. The bed race regulations sound to me as if the organisers had applied for one of those Erasmus 2 grants from the EU’s wasting money department and in consequence were issued with a pile of paperwork large enough to construct a bed…. If I didn’t know how heavy paper gets in the water, I’d think you were right, but health and safety requirements forbid the use of all-paper beds in the race. Which reminds me: It’s time to order printer paper. Thanks for that. Are you telling us that American men don’t dress up as women at the drop of a hat? What’s wrong with them? I think bed races originated with medical school rag days, although I don’t know when they originated. I love the trebuchet and egg thing. We’re really in hammer to crack a nut territory there, even though the trebuchets aren’t very big. You really need to take a look at the link Val sent–people using a trebuchet to hurl a piano. Absolutely insane, but something about it appeals to me. But no, American men not only don’t dress up as women, they’d be horrified at the idea. I hope the piano was dead before it was set alight. Now I’ve gone from assuming that most men are happy to dress up as women to wondering whether it’s only the English who do it. It’s a hard thought to have. The women’s clothes thing is–well, I keep hoping someone will explain it to me or I’ll find some deeply buried reference somewhere that’ll explain it. So far, no luck. Knowing that women’s clothes aren’t designed for comfort only deepens the mystery. And yes, I’m quite sure the piano was dead before it was set in the trebuchet. It would never have stayed still otherwise. Before I realised it was unusual, I never thought about it much. Now I’m wondering if it has anything to do with panto. On the other hand, since all actors were men until (I think) the late seventeenth century, perhaps we have a very old tradition of men dressing up as women. The same thing must have applied in other countries, though. Those are the same tracks my mind’s taken, and the same reason that I haven’t been convinced that they’re the right tracks. Lord Google can do no better and is also a lot more interested in transevestitism. Something to keep in the back of the mind, I think. If Lord Google is running down the wrong path, there’s no hope for any of us. I was on my way in to mention the med. school origins of bed-racing. Most teaching hospitals had a bed race of some sort after finals exams. Why, of course they did. How could anyone claim to be a doctor and not know how to race a bed? I’m a fairly peaceful person, but I’ve always been impressed with trebuchets even though I know they were/are pretty vile weapons. Using them to sling eggs is one thing, some people though use them to sling pianos, which I can never approve of… https://www.youtube.com/watch?v=hZxCEkGk6HI As for who the eggs should be aimed at.. how about one of those politicians on Instagram…? I understand your reasons for objecting, but something about slinging a piano with a trebuchet appeals to me. Any idea why it caught fire, though? My understanding of pianos is that, other than being made out of wood, they’re not all that flammable. Or “how to create a real self,” with special attention to the people who don’t actually have one. My oldest son was obsessed with trebuchets when he was about 7 or 8. I am glad he never thought to use one to launch eggs. I admit that my fondness for schadenfreude led me to chuckle at the thought of that runner sneaking off to a bush for a quick pee and finding a python. I hope he had already relieved himself before he got the shock. I had the more or less the same response to the python story. That’ll teach you to pee standing up. Of course, squatting over it would’ve been much, much worse. But schadenfreude never was amenable to logic. And that’s the first time I’ve ever used schadenfreude in writing. And this, children, is why you should harken to the story of the Trouser Snake. I never knew how weird we were until I found your blog. Thanks for the mention in dispatches. Let’s face it, we’re all a little strange. Another big thing is using trebuchets to launch pumpkins ! This begins in October and continues to the end of November and has spawned several reality TV shows. “Punkin’ Chunkin” has the most viewers. My view of science was colored by my incompetence with numbers, but dropping eggs off the roof? Now that (if I could’ve gotten myself close enough to the edge) I would’ve enjoyed. I bet the janitor just hated every last one of you. I say that in the firm belief that not all the eggs were well enough packaged. We once celebrated a birthday by throwing eggs at a target and the cleanup was–well, it wasn’t the best part of the day. Trebuchets and pumpkins? Sounds workable, although (see the comments about trebuchets and pianos) you can’t set them on fire. As always you’ve managed to inform and entertain. Bed races! Oy, brings back memories. We had those on my college campus each year. They were hysterical and really an excuse for a very large party. I cannot say that all participants stayed sober until after the race:). I’d guess this race is exceptional in asking everyone to stay sober. Or–well, all I know is that they ask, not that people follow instrutions. There’s nothing like a good old-fashioned bed race. Some years ago, we set out two wheeled bed bases for the county to collect (we couldn’t find anyone who wanted them) and the our neighbors’ kid’s eyes lit up. I’m sure he was seeing a bed race. He had a weakness for anything on wheels, including skateboards with plastic boxes balanced (however briefly) on top. I hated to say no, but we’re on a slight hill, it leads into traffic, and whoever designed the bed bases hadn’t thought to put brakes in. I felt like Scrooge, but I did make myself say no. The good news is, he lived. I couldn’t have guaranteed it if he’d raced them. Aw, I would have snuck over and taken them after dark. That sounds so cool. It’s a pity, isn’t it? He was a good kid and I don’t think it ever crossed his mind. Ok, wait. So let’s see if I’ve got this…a team of six legless lizzards take ropes in their mouths, and pull a bed with a British socialist politician in a woman’s nightgown accross the Nidd, (sounds familiar somehow) while a team of fragglerockers in viking helmets toss pointed ostrich eggs in clay gravy pots, and hospital nurses in Carry On costume toss flaming dung at them from a trebuchet. Wasn’t this banned in the Magna Carta? What a joy your blog is. Oh for jolly England, now that fall has fell. I can’t top that. I can’t even keep it going, but I can at least thank you for a much-needed giggle. Do you know what happens to the trebucheted eggs? I have an image of a major feast day for the foxes and raccoons. I hadn’t thought about that. Probably. And (sorry) the rats…. This is totally a scream…I’m still smiling, only disappointed, like a good novel or short story or perhaps fake news, that it came to an end…well done, aka in British, brilliant. Thanks, Jim. Happy to have left you screaming for more. And here I’d been thinking that I needed to back off the news clips for fear of boring people. Wolverhampton University has a professor of Herpetology. Go figure. I don’t think I’ve ever heard of this race, to be honest. Too funny. A bed decorated in the theme for the year….So what’s the theme for the year? What would I choose. Gee. I’m overwhelmed. As I read the lead-in to the question, I had a mental image of beds wrapped in ribbon so that they looked like candy canes, but that’s not bizarre enough to do justice to the event. Dog beds? No, no, Pastafariaism. (See this week’s post.) Definitely Pastafarianism. Yes, before someone decides to enter your bed in the race and you wake up surrounded by cheering (sober, presumably) bystanders.